Video (01:17) : Check out why we chose these burgers as some of the very best in the Twin Cities. Editor's note: This story was originally published in June. To be clear, this isn’t one of those best-burgers-in-the-Twin Cities compilations (find that here and watch the video above for more favorites). Instead, Burger Friday – which places a weekly spotlight on a gotta-have burger – is marking the year’s midpoint by revisiting the five burgers that made the most favorable impressions so far in 2018. They’re listed here in no particular order (translation: there’s no hidden agenda in the sequence), just know that they’re all worth seeking out. And then some. Those two thin, small-ish patties will never be described as "bruisers," but they pretty much embody all that is good about the word "decadence," at least from a burger standpoint. DeCamp starts with the same over-the-top chuck-brisket-butter formula (the ratio is six parts beef to four parts Minnesota-made Hope Creamery butter) that he uses for his Constantine burger. Then, because that's not enough, he incorporates bacon to the grind. Next up: DeCamp lavishes plenty of soft, sweetly caramelized onions over the patties. DeCamp buys the sesame seed-topped buns at Cub. I know: Cub. And this is where this hamburger-bun snob learned a major lesson: one of the Twin Cities’ top chefs shops at Cub (“Chefs — They’re just like us!” would be the Us Weekly headline), then applies his know-how to flip a perfectly serviceable supermarket product into an occasion. The secret? Butter (and plenty of it, of course), and heat. Warming the bun softens it (and subtly enhances its yeasty flavor), and when all that butter comes in contact with the stove’s heat, it transforms the bun’s inner flat surfaces, giving them a elicate and delectable toastiness. Follow this practice at home, folks. Your burgers will improve, without question. DeCamp also doesn’t skimp on the cheese. Final touches include a layer of crunchy, tangy pickles —along with a chopped pickle relish — tucked under the bottom patty. “It’s just all the familiar flavors, you know what I mean?” said DeCamp. Totally. Address book: 1115 2nd Av. S., Mpls., 612-353-6207. Patio open 4 to 10 p.m. Monday through Thursday. The “Dirty Double” burger is also available at Constantine (located on the lower level), which opens daily at 5 p.m. 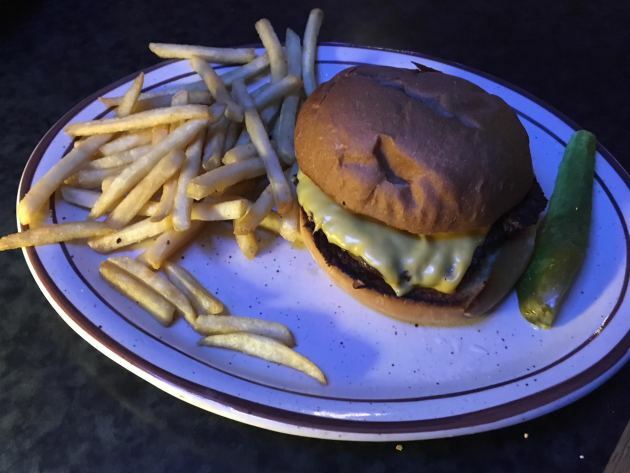 Shantytown Bar & Grill: To my everlasting regret, I had been stupidly unaware of this dive bar's existence until Burger Friday reader Kim Whalen of Lakeville recommended it. Thanks, Kim. Nothing about the modest building's exterior indicates that it's the purveyor of a classic – the argument could be made for standard-setting– dive bar burger, sold at a barely-more-than-Five Guys price. The third-pound, free-form patties (“It’s angus, always fresh, never frozen,” said Taykalo) are seared on a well-worn flattop grill until the beef skirts past a no-nonsense medium, allowing tasty bits of sizzled char to form on the outer edges. The bun – a soft-yet-sturdy specimen that's baked at the nearby Denny’s 5th Avenue Bakery – gets brushed in butter before getting a dark, crispy toast on the grill. Cheese? It’s salty, gooey American, although Cheddar, Swiss, mozzarella and pepper Jack are also available. The sole garnish is a standard-issue pickle spear. That’s it, just the three basic, well-handled burger food groups: beef, cheese and buttered-up bun. No pretense, no complications. Exactly what a dive bar cheeseburger should be. Price: $6.25 for a basic burger, $6.50 for a cheeseburger (pictured, above), $7.25 for a bacon-cheeseburger and up to $8.50 for a specialty burger. Fries included. Address book: 8512 Pillsbury Av. S., Bloomington, 952-881-7223. Open 11 a.m. to 11 p.m. Monday through Thursday, 11 a.m. to midnight Friday and 11 a.m. to 1 a.m. Saturday. 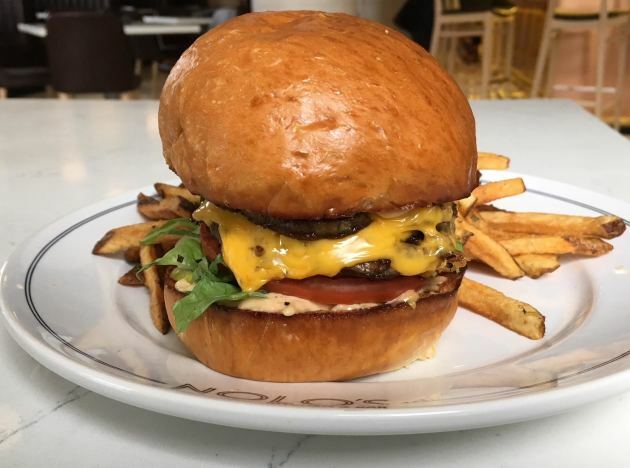 Nolo's Kitchen & Bar: There are several reasons why chef Peter Hoff adheres to the diner-style, double-patty format for his gotta-have cheeseburger. Like many other first-rate Twin Cites burgers, this one wisely relies upon ground beef from Peterson Craftsman Meats in Osceola, Wis. The golden, challah-style bun – soft, with a subtly sweet after-bite, its interior crisply toasted -- plays a key role in this burger’s success. It’s baked at Turtle Bread Co. The cheese? Two semi-melted slices of American. As for the umami-boosting, Thousand Island-like sauce, it’s Hoff’s homage to his beloved In-N-Out Burger, his burger go-to when he was living in California. Given this attention to detail, it should come as no surprise to learn that Hoff sells a lot of burgers. Address book: 511 Washington Av. N., Mpls., 612-800-6033. Open 7 a.m. to 10 p.m. Monday through Thursday, 7 a.m. to midnight Friday, 8 a.m. to midnight Saturday and 8 a.m. to 10 p.m. Sunday. Burger available at lunch, dinner and weekend brunch. Lowry Hill Meats: Yes, this is the burger that I declared the best I’d tasted in 2016, the year that butcher/owner Erik Sather introduced it into his weekly specials rotation. (Find my original Burger Friday entry here). And yes, it continues to reside in the upper echelons of the Twin Cities burger pantheon. I’m including it in this mid-year roundup because Sather used the Super Bowl as an opportunity to expand the burger from its Wednesday-only schedule into an available-daily commodity. The early Februrary test run was so successful that Sather made the experiment a permanent gig. The version that Sather is serving closely follows the same format as the burger I first raved about in 2016: deeply flavorful quarter-pound patties made with ground beef sourced from single steers. Other components include house-made American cheese, tangy house-made pickles and caramelized onions. Rather than import buns from elsewhere, Sather taps the considerable skill set of colleague Gabe Carlson, who bakes a brioche-style bun with a butcher shop twist: instead of milk, this soft, golden beauty is fortified with fat from the shop’s hogs. They're fantastic. As is this burger. Price: $10. Make it a double for $13. Add an egg for a buck. Address book: 1934 Hennepin Av. S., Mpls., 612-999-4200. 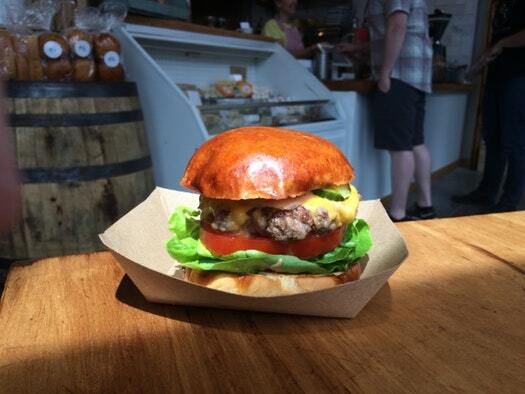 Burger is available during the shop’s hours: 10 a.m. to 8 p.m. weekdays, 9 a.m. to 6 p.m. weekends. There's a small (free) parking lot; enter on Colfax Av. 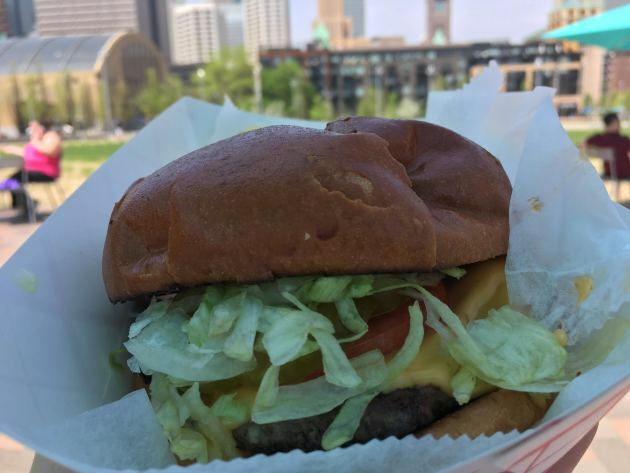 Simply Steve's: Owner Steve Ramlow has always placed a burger — make that, burgers— at the forefront of the menu at his eight-year-old food truck. “Personally, I just like them,” he said. For his popular California burger, the formula is, yes, simple: A nicely fatty beef that’s fresh, never frozen, well-seasoned and cooked on the flat top grill in its own considerable juices. A gooey slice of American cheese injects another jolt of saltiness. Onions are fried in butter, their sweetness accentuated by the grill’s heat, with the butter laying on another layer of decadence. Butter also plays a role with the bun, which gets a generous swipe of the stuff before it’s toasted on the grill. By the way, that bun? It’s a doozy, a brioche-like beauty that comes from the ovens at Franklin Street Bakery. Indeed. It’s also larger than the basic-issue burger bun, a two-handed whopper that knocks the essential bread-to-beef ratio slightly off kilter. Still, with a bun this good, who cares? Ramlow isn’t shy when it comes to laying on all the appropriate California-style embellishments. A juicy tomato slice. Crunchy chopped lettuce. Vinegar-laced dill pickle chips. Plenty of mayo. The combination has endured as a burger classic for a reason; it works. No fancy bells-and-whistles, just honest-to-goodness burger deliciousness. Which certainly resides well within the Simply half of the Simply Steve’s brand. Address book: Track the truck’s whereabouts on Twitter and Facebook. Talk to me: Do you have a favorite burger? Share the details at rick.nelson@startribune.com.